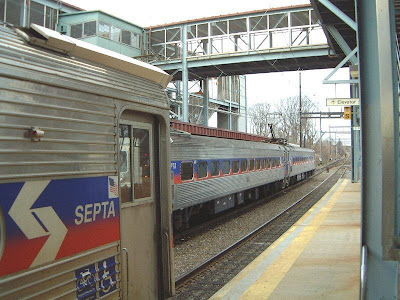 SEPTA Regional Rail will operate trains with extra capacity for bicycles on Sunday Morning on the R5 Malvern Paoli Line and the R3 West Trenton Line. All other Regional Rail Lines will continue to allow 5 bicycles per train as long there is sufficient space available. The R3 Train will depart West Trenton at 5:58 AM and make all local stops to 30th St Station including Yardley at 6:01, Langhorne at 6:09, Somerton at 6:16, Jenkintown at 6:31 and Melrose Park which has a high (door level) platform at 6:35. Arrival time at 30th Street Station is 7:04 AM. Once at 30th Street Station you should exit at the 29th Street entrance and use the crosswalks to get to the south sidewalk of the Market St Bridge (the bridge with the eagle sculptures) and proceed across the bridge to the ramps down to the Schuylkill River Trail. When you get to the bottom of the ramp turn right on the trail to get to the Art Museum start point of the ride.